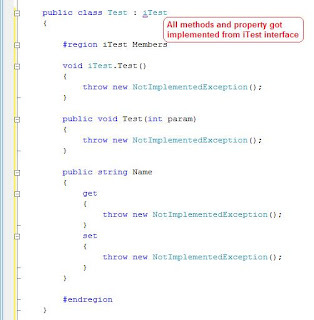 Whenever you create an Interface and implement in a class, you need to remember and override all methods or need to verify whether all methods/properties are impmenented. Using shortcut below you can implement all methods and properties of an Interface in inheriting class with click to three keys... i.e. "Alt+Shift+F10". In the example below, I have created Interface with two methods and one property. While inheriting this interface in a class named "Test", you need to press "Alt+Shift+F10" on interface to implement all the methods and properties. Press "Alt+Shift+F10" and press enter to implement all methods and properties.